On Sunday, I enjoyed a profoundly lovely and uplifting performance by the Student Angklung Orchestra and the House of Angklung of Washington, D.C. The Smithsonian’s Freer and Sackler Galleries presented this concert in partnership with the Embassy of the Republic of Indonesia in Washington, D.C. as part of a weekend-long public program titled Performing Indonesia. The program featured performances, family workshops, and a symposium showcasing music, dance, and theater from West Java. 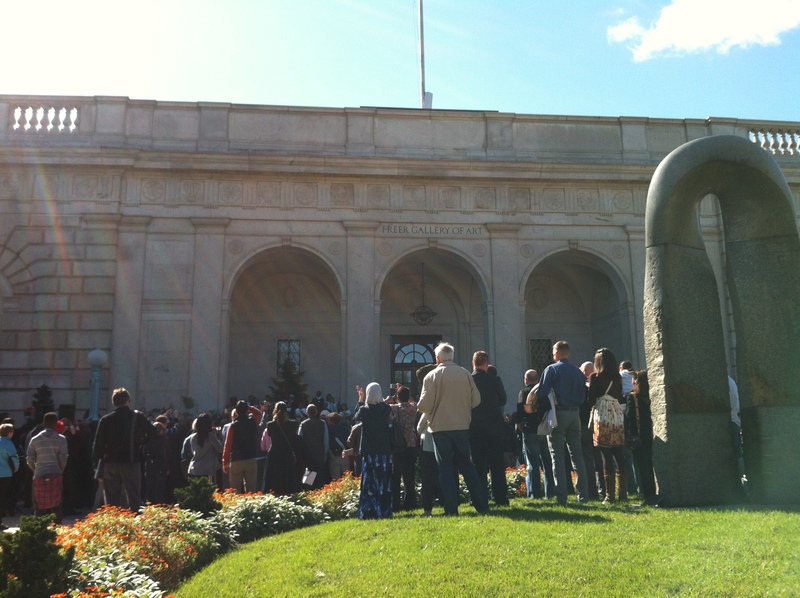 The performance took place on the Freer Gallery steps, a visually impressive and openly accessible location. I arrived to a mass of beaming parents and a sea of smart phones stretched above heads—kind of a beautiful sight. I immediately noticed the atmosphere of pride and fun. The Student Angklung Orchestra turned out to be a group of two hundred Washington-area elementary school students each playing angklung, a traditional West Javanese bamboo musical instrument. Performing alongside them was House of Angklung, a local cultural group that promotes peace and harmony through sharing culture (see website). The museum seemed to make an important contribution to the educative, social, and personal value of the performance. Specifically, it provided a formal structure for the event and an interpretive context for visitors to pursue further learning through related resources. Moreover, the museum created a sharing context where knowledge and learning generated pride for both performers and audience members. The angklung was displayed for audience members to see up close. Throughout the concert, the students shared their knowledge of Indonesian language and culture with the audience. The educative impact of the program (both for the performers and the audience) was apparent and impressive. Collaboration between the student orchestra and the House of Angklung group was a great display of multi-age collaboration (which I discussed in a past post). Important collaborations also took place between the students and their parents. Towards the end of the concert, volunteers handed out angklung and taught parents how to play them. For the final medley of songs, parents were invited to join the students on stage for a collaborative performance. An impressive number of individuals were willing to give this a shot—perhaps because the conductor and volunteers had worked hard to cultivate an attitude of fun and acceptance. The performance turned out to be a moving celebration of family and teamwork, which (based on what I learned about angklung and Indonesian culture) seemed fitting. In researching this post, I stumbled across a 2007 post by Nina Simon on her blog, Museum 2.0. She discussed the issue of visitor performance in the museum, wondering whether visitor input may be particularly useful and meaningful when visitors have an awareness that they are producing content for a particular audience. Certainly, I think it is true that when we know that our efforts will be shared with others we generally seek to do our best and to offer something of quality. Nina suggests that museums help visitors make a genuine contribution to the museum experience when they encourage them to consider both the input and the output experiences generated by their participation (Nina Simon, Museum 2.0). This mission cites enjoyment of arts and culture as an important institutional goal. By creating opportunities for achievement and pride, the Performing Indonesia program clearly speaks to this mission. Therefore, pride is a powerful force for wellbeing because it impacts not only the creator/performer, but touches anyone who cares about and associates themselves with that person, including family members, friends, and community members. Pride is something that we can share. Museums can use objects and physical spaces as well as intangible heritage such as the practice of angklung, which is inscribed on UNESCO’s Representative List of the Intangible Cultural Heritage of Humanity. I’m curious to hear from museum professionals. Do you provide opportunities for visitors to perform in your museum? What are some of the management and design considerations that make it possible for visitors to create useful content/experiences for other visitors? Is visitor pride a relevant goal or outcome for your institution? I find the Freer|Sackler to be a remarkably caring institution. (My personal impression is that they have the most warm and welcoming security guards of any museum I have been to.) Their Performing Indonesia program suggests there can be great harmony between an educational and scholarly mission, and programming that fosters visitor wellbeing. I am excited to continue exploring their programs.